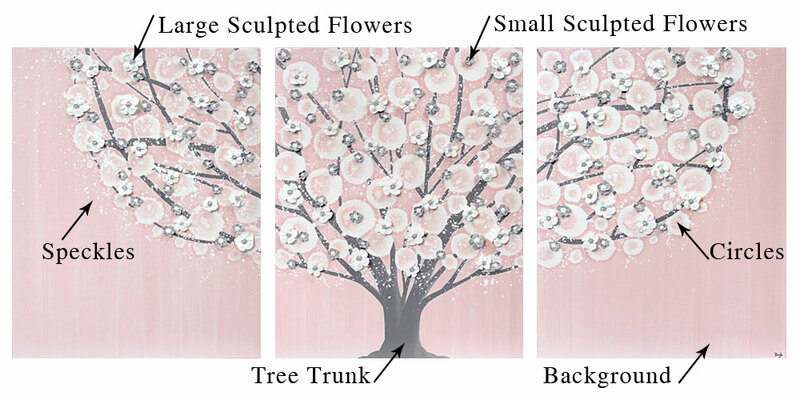 Your flowering tree painting will be an original artwork, hand-painted on three canvases that fill a 50″ W x 20″ H space. Each apple blossom will be individually hand-sculpted by artist, Bethany Ogle. Step 1: Choose colors from the color chart below for the different parts of the tree. The circles are always white. Type your choices in the form below and click submit. If you would like to see a mock-up of the color placement you choose, let me know in the “ask a question” box. Step 2: A reserved listing will be set up for you. A link to the listing will be emailed to you. Add the custom painting to your cart and checkout to place your order. Step 3: In two weeks, your custom painting will be complete and ready to ship to you. You will receive a tracking link for your painting. Type your color choices from the color chart in the boxes below for each element of your painting. I am the artist creating the nature inspired paintings available exclusively at Amborela. I work mainly with acrylics, India ink, and fabric. I ooh and aah at beautiful colors and interesting textures. Nursery Wall Art, Tree Wall Art, Triptych Wall Art. Bookmark.